If you learn how to use a desk calendar the “right way” it can skyrocket your productivity. A desk calendar? – you ask. Is this the dark ages? Disclosure: I received the calendar and pens pictured here free of charge from Erin Condren. All favorable opinions are my own. Use the form below to sign up for our newsletter and we will send you our Goal Setting Worksheets. It is actually a great time management tool to help you get organized and accomplish your most important tasks – if you use it intentionally. This is how you should be using it. It is very common for people to use a desk calendar as a glorified doodle pad. Or they use it as a desk pad to protect the surface of their desk and cushion their writing – which is ok, but then you are not using it to it's full potential. Still other people write every appointment and event under the sun on their desk calendars – or they do exact opposite and write nothing at all. If you make any of these mistakes you are not going to see a desk calendar as the powerful planning tool that it is. The key to making a desk calendar work hard for you – is to use it with intention. 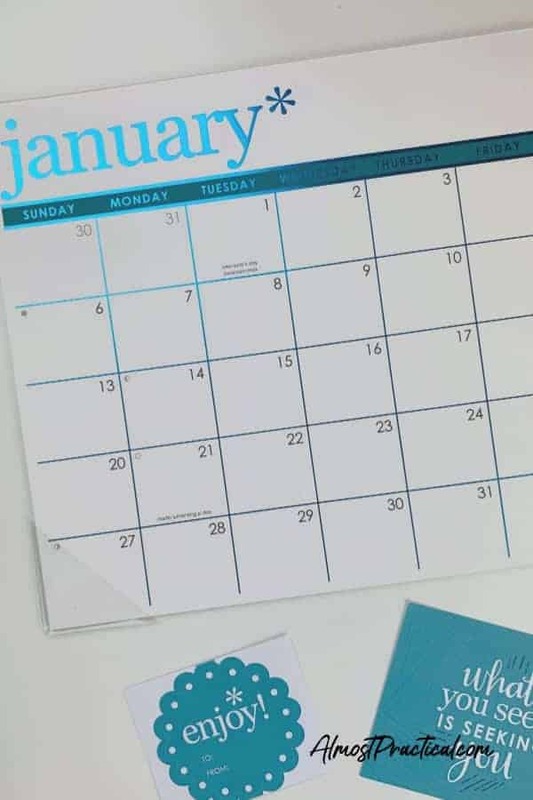 Think about it – if you have a desk calendar on your desk, it will be the first thing that you see when you sit down to work, either in your home office or in your place of business. If it is covered in doodles or crammed with too much information then it just becomes visual noise and clutter that you turn a blind eye to. In essence, it loses it's effectiveness. But if you only include important information on your desk calendar, and make a habit of a 5 second focus on your day each morning then you will move closer to your goal. 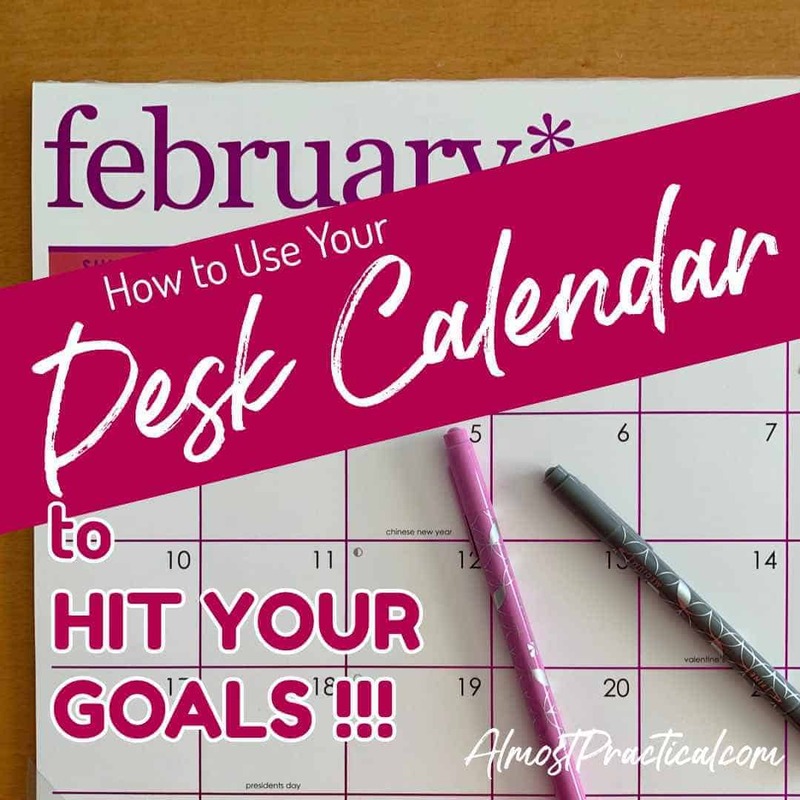 The first step to using a desk calendar effectively is to decide what you want to use it for. Remember that it is not your only calendar – it is merely a tool to help you achieve a goal (notice that I am talking about a SINGULAR goal here). Pick an area in your life where you need planning help to stay on track. This could be something as simple as remembering the birthdays of your friends and family, or it could be something like remembering when bills are due so that you pay them on time. A desk calendar is best used for things that you tend to forget, because it will serve as a visual daily reminder. Of course, you probably use the calendar on your phone or a paper planner as well but these things are sort of “out of sight out of mind”. You have to take the steps of checking your phone or opening your planner. But a desk calendar is wide open and is staring you in the face when you sit down. So, before you write a single thing on your desk calendar, make a decision on what you want to use it for. 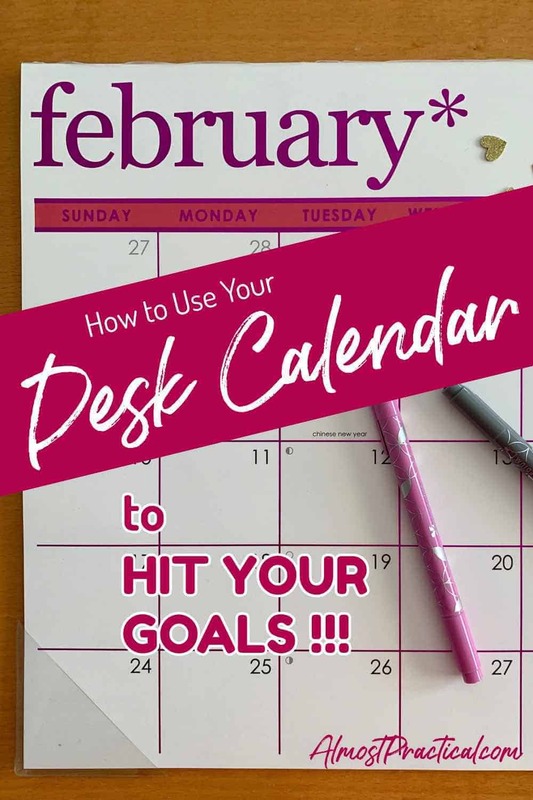 The second step to using a desk calendar effectively is to write down your (singular) goal somewhere on top page of the calendar. Write it in big, bold lettering across the top or down the side, so it jumps out at you every day. I like this Erin Condren desk calendar because it has space down the right side where you can write your goal down. You can even write the steps that you want to take to make it happen. For example, if you are always late paying your bills, then your goals is to pay bills on time. Well, you will obviously write the due dates of all your bills on your desk calendar. But before the due dates you need to actually mail the check or pay it online. Every Monday: review bills for the following week and schedule payments or mail checks. As your bills come in, you should be putting a note on the days that they are due. But if you are doing your bill paying work on Mondays, block that time out on your desk calendar every Monday. Any issues with bills? Make those notes on your desk calendar, too. So, if we run with my example above and you are using your desk calendars to help you stay on track with paying your bills – then DON'T go and start writing peoples birthdays on the same calendar! If you do this – then your calendar will become cluttered and noisy and you will start to ignore it. The upside to the desk calendar is also it's downside – it is wide open for not only you but for all to see. At least all those that pass by your desk. So, you might not want to use your desk calendar at your place of work to track your bills, your health issues, or other sensitive and personal type information. « Elite Blog Academy 4.0 – 12 FREE Resources You Can Download Right Now!